Barberstown Castle is one of the most luxurious and relaxing locations in the country with stunning scenery, beautifully landscaped gardens, roaring log fires and antique furniture and art throughout. Barberstown Castle has managed to retain an elegance of design that spans over eight centuries by sympathetically blending its Victorian and Elizabethan extensions with the original Castle Battlement of 1288. Head Chef Bertrand Malabat, originally from Bordeaux in France, will impress even the most discerning of diners with his new 6-Course Tasting menu. He specialises in game and fish dishes garnished with herbs from the hotel’s enclosed herb kitchen garden. The food is Irish country house dining with a French influence and has received numerous awards consistently. There is also an extensive wine collection of over 100 bins with all world wines and a particular focus on French classical wines. After dinner guests can retire to the Garden Bar and enjoy the open log fires, music and convivial company. “The Barton Room is a venue with culinary ambition, and with a dining room filled with as many locals as hotel guests it is showing signs of developing a reputation as a stand-alone quality restaurant worth traveling for, a feat many hotel restaurants fail to manage. 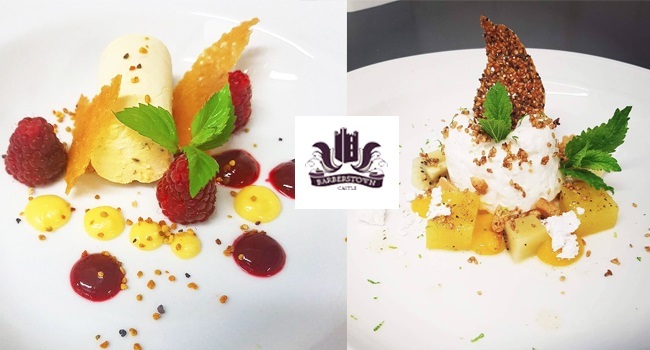 TheTaste and Barberstown Castle are giving readers the chance to savour their 6- Course Chef Tasting Menu for Two People for only €89.